The only Windows 10 review you need to read…..seriously. Windows 10 is upon us, as are the Windows 10 reviews. With over 67 million downloads thus far, it’s easy to say that Microsoft is happy about the position it’s in with the fledgling OS. Unlike Windows 10, when Windows 8 came out, it was met with much opposition. 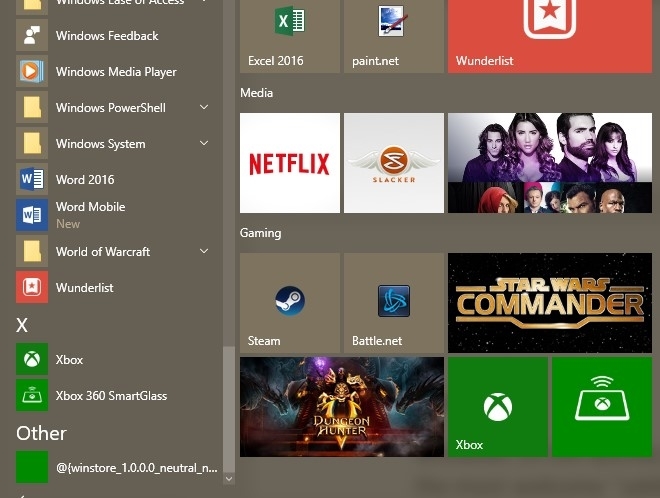 Gone was the familiar start menu and in its place was a brand new start screen that didn’t just occupy a familiar corner in Windows, but the entire screen. Microsoft also went all in with the touch interface in Windows 8, so much in fact, it ostracized mouse and keyboard users and made using them clunky and tedious. Don’t forget Metro apps. It made multitasking awkward, and just didn’t fit desktop usage that well. Even with Windows 8.1 fixing a number of complaints, it wasn’t enough to sway people to get to know the Windows 7 successor. As such, users fell into one of a few camps. Either users gravitated back to Windows 7, where things made sense, or they begrudgingly got used to Windows 8. But that seems to be the way it is for Microsoft, every other iteration saves us from the previous one’s problems. XP saved many from Windows ME, Windows 7 saved us from Vista and hopefully in Microsoft’s case, Windows 10 from Windows 8.1. But does Windows 10 actually save us from Windows 8.1? Let’s find out. It should be noted that I’ve been using Windows 10 since March. When I first dove into Windows 10, I was on the Insider Preview 10041 build. It’s certainly been a roller coaster as each Insider build rolled out, with the addition and subtraction of various bugs as Microsoft worked toward the RTM (10240) build. Absent from the RTM build is the Windows 10 Insider Preview watermark. It’s also the build we’ll start seeing on new PCs. For the sake of this review, we’re going to focus solely on the Windows 10 Home RTM build, the build I’ve been using for the better part of a few weeks. So without further ado, let’s take a look at the good and bad of Microsoft’s newest OS. The first thing you’ll notice in upgrading to Windows 10 — or when you purchase a new device with the OS — is the return of the start menu. Boy, what a return. I never knew how much I missed it until I started using it again. 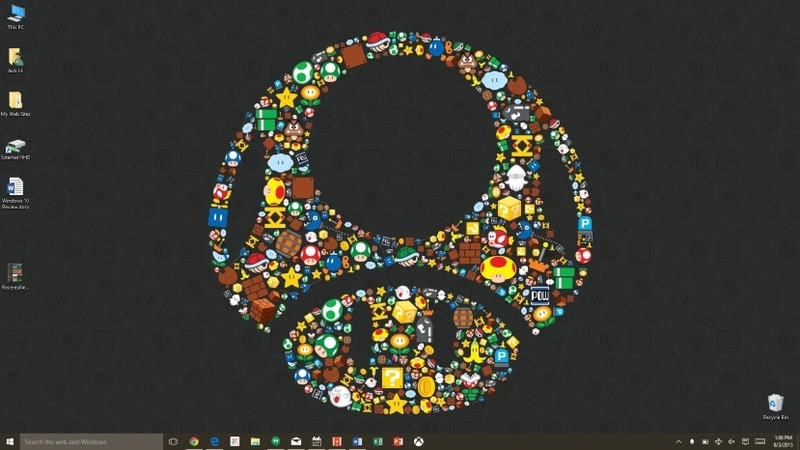 Like the start menu of old, the menu acts as a starting point complete with all your favorite pinned apps. Not only that but you have access to all your installed apps, as well as a number of perks like most used, file explorer, etc. 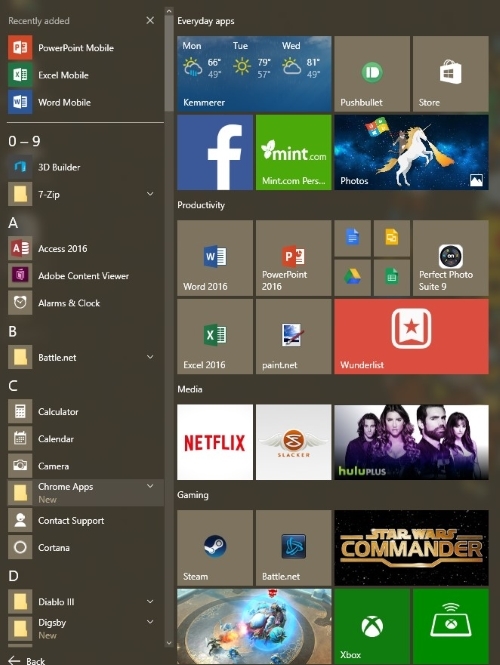 Windows 10’s Start Menu, offers the menu we grew up with, with the added benefit of live tiles. 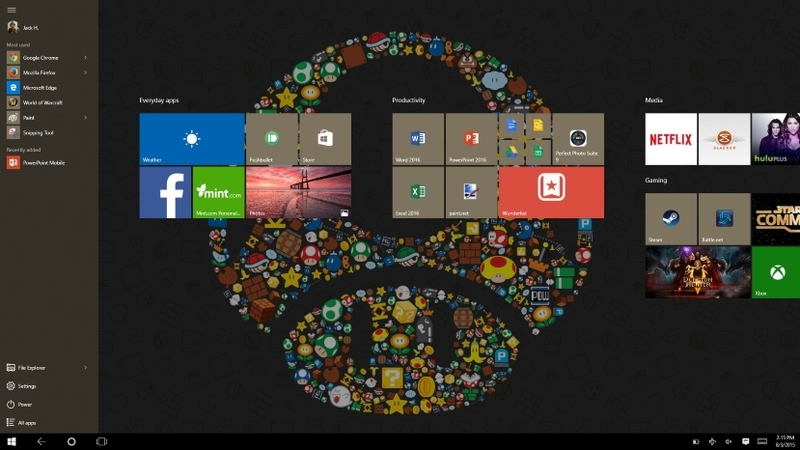 For those who are familiar with Windows 8, Microsoft pulled the live tiles from the start screen and added them to the start menu. It’s a nice touch that makes a lot more sense on a desktop or laptop, and is what Windows 8 should have done. Another nice aspect is unlike the Windows generations of before, the recent apps sit up top in the complete apps list, and rather than an ugly orange bar highlighting new programs, the word New sits under the app name, subtle and effective. As far as the overall theme for Windows is concerned, it also falls under the subtle but effective category. It improves on Windows 7’s bland theme and makes it fit Windows 8’s Metro style. However, unlike Windows 8, it’s not in your face. Also, much like the Aero days of old, Windows 10 has just a bit of transparency to it that give it a more polished look. Plus, having the ability to use a dark theme in a number of apps, is a minor bonus, but a bonus nonetheless. One of my more favorite newer aspects of Windows 10 is the Action Center. In my opinion, it feels somewhat like Apple’s notification tray in OSX, but unlike Apple’s, I find myself actually checking this one to see what I’ve missed. The Action Center groups all notifications in one handy area. Another feature that reminds me a bit of OSX is the new Task View. It, like the Mission Control in OSX, shows you all the open windows you have. It’s nice when you want to go to a specific window that’s open. This is also where you go to take advantage of another feature packed into Windows 10, multiple desktops. That’s right, a feature long been clammered for — and one that’s been in Linux and OSX for years — has come to Windows 10. Task View, while not without bugs, allows you to find the specific window you’re looking for. This will be an organized person’s dream as you can use multiple destkops for a variety of things. You could have one desktop dedicated to media, gaming, productivity and so on. One thing I’ve noticed is you can’t have multiple instances of an app open. 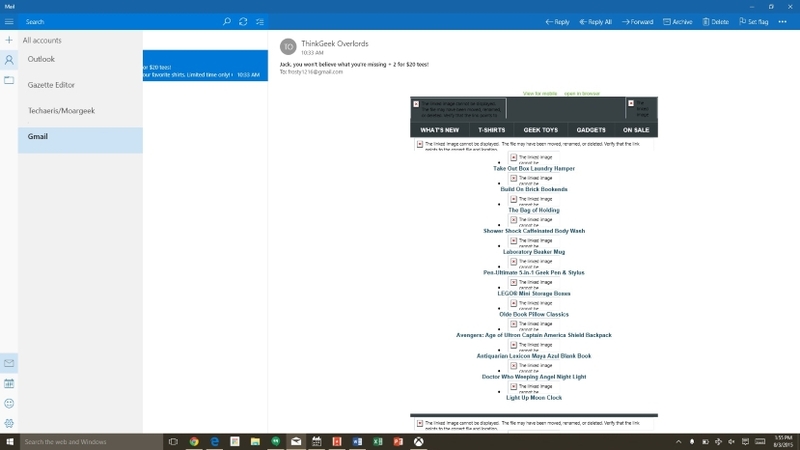 So if I have Mail open in one desktop and try to open it in another, it will automatically go to the first desktop it was open in. Though, there is no easy mouse gesture to move between each desktop and you have to rely on task view or the keyboard (Windows Key+Ctrl+Left or Right Arrow). 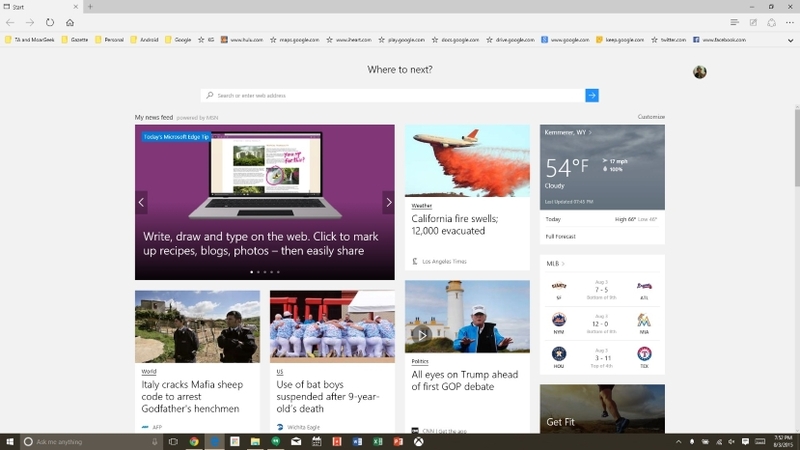 Continuing on the trend of new, Microsoft has added a “new” web browser to the mix. I say “new” because while Edge seems more in line with modern web browsers, and a good step forward, it still feels like Internet Explorer sometimes. If you need proof, just look at the Edge icon, something that resembles Internet Explorer’s icon. 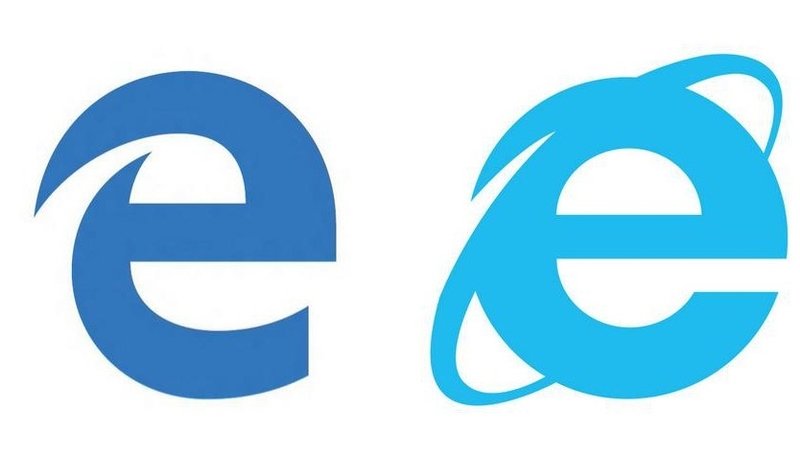 Edge icon on the left, Internet Explorer on the right. 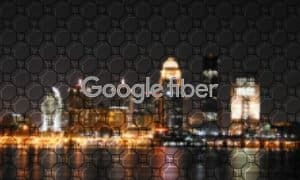 For those that don’t know, I’m an avid user of Google’s products and services and while they function well for the most part in Edge, sometimes I notice a glitch or two that makes the experience less than smooth. However, for the most part, I’ve found Edge to be somewhat faster in loading web pages to that of Chrome or Firefox. I do also like that the new tab page offers news and information, for a quick glance that’s pretty handy. Edge’s informative tab page is pretty handy for information at a glance. Also, Edge has the ability to snap a screenshot and draw on it. It’s a great tool if you want to scribble a note or bring attention to something on a page when sending it to someone. While it’s a fun tool to have if you have a stylus or pen, like on the Surface Pro series, I found that I only used it once or twice before not using it at all. One of my biggest complaints is how Edge handles bookmarks. I’ve found no easy way to edit, add or organize bookmarks. While this is a non-issue for some, this is an aggravating thing for me. Another thing I find annoying is that it’s a chore just to switch search engines. I get Microsoft wants us to use Bing but I’ve been using Google for years. I have to Indiana Jones my way through the settings menu just to change it. Granted, Chrome does, too, but it’s tedious. Firefox gets the nod here as it’s quite easy to change the search engine without going anywhere. Also missing are extensions. Both Firefox and Chrome have these available and my browsing experience isn’t as rich without them. 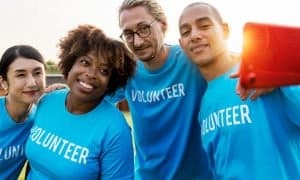 I know Microsoft will eventually bring these to Edge, but I found that with the bookmarks hassle and lack of extensions, Edge is OK enough to use for light and general browsing with power surfing left to Chrome or Firefox. Another new aspect to Windows 10 is Cortana, a feature like Siri and Google Now named after the AI in Halo. Cortana does really well at maintaining need to know information at a fingertip. Like Siri (in iOS9) and Google Now, Cortana displays relevant information. She does this by keeping a digital file on pertinent interests and information. From weather to news, you’ll get a bevy of information. Cortana offers contextual information while offering web and local search. 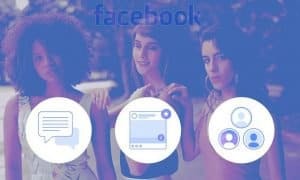 The nice part of this is, like Google Now, it’s cloud based, so your information can be synced amongst your Windows devices, and even Android. While that’s useful in itself, I mostly used it to find apps, images or documents locally. Let me tell you this, when it comes to this task, Cortana does it beautifully. Not only does Cortana do this locally, but she searches through data stored on OneDrive. With that ability, coupled with local and web searches, Cortana is a pretty robust tool to use. 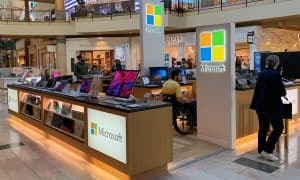 While the Windows 8 app store was a bit of a joke when compared to that of the competition, Microsoft is working hard on making the Windows 10 app store more appealing. Not only that but the Microsoft baked apps installed in Windows 10 are actually worth using. The Mail, Calendar and Xbox apps are some of the most used apps on my ThinkPad. The first moment I used the Xbox App, it became an instant favorite. The reason being is that I can finally stream Xbox games to my laptop. By plugging in an Xbox One controller to USB, I can instantly play Destiny or Halo in the comfort of my bed or couch without having to go into the TV room. 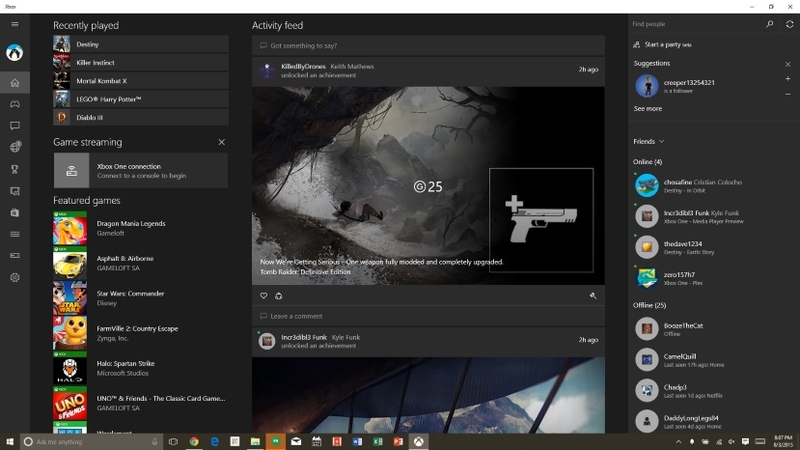 The Xbox App allows for live game streaming, messaging, game DVRing, etc. I will admit, the experience isn’t the greatest at times in terms of graphics. I typically play wirelessly and have to drop the graphics to low in order to get any decent framerate. Despite some artifacts when playing, the experience is pretty OK for the most part. 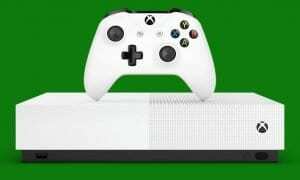 It should be noted that Microsoft recommends playing via a wired connection (both computer and Xbox) and the experience should be substantially better than over wireless. But still, while the experience isn’t the best, it’s still playable. Another feature the Xbox app packs is a Game DVR that allows you to record screenshots, videos and clips up to two hours. 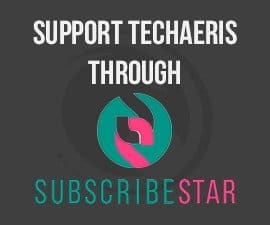 This is handy for those who want to record a gaming tutorial or for those who want to show a gaming clip to a buddy. As far as other apps are concerned, the Mail and Calendar apps have become mainstays of mine. Managing multiple email accounts in Mail is a breeze. While it takes an extra click to go between accounts, Mail makes whatever account the forefront of what you’re doing. For example, when I need to look through my work email, I’m not distracted by whatever emails come into my personal account. The Mail app does really well at getting out of the way. The Calendar app now allows me to sync Google Calendar, making my life a heck of a lot easier. It does really well at showing me what’s going on for the day without really getting in the way. Though, a lack of Cortana integration seems like a missed opportunity. One app that desperately needs a new coat of paint is, well, Paint. I feel that Microsoft could really do well to beef up the app to make it worth using for more than a simple screenshot copy and paste, save job. I mean, look at Paint.net, an app I spend a decent amount of time using. It’s robust and feature rich, something Paint could learn from. One last app I’d like to touch upon is Solitaire. 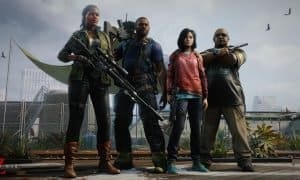 I know a lot of people are upset at being charged $10 a year to play a game that’s been free in other iterations of Window’s and while most people will scoff at paying such a price, this isn’t anything new as the company has been using the in-app-payment model since Windows 8 first came out. One of the biggest complaints for Windows 8 was a lack of apps in the app store. Don’t get me wrong, there were awesome developers who created unofficial ports of the big apps that were missing, like Instagram, but official apps just weren’t a big thing and Windows 8/Windows phone users had to make do with unofficial replacements. 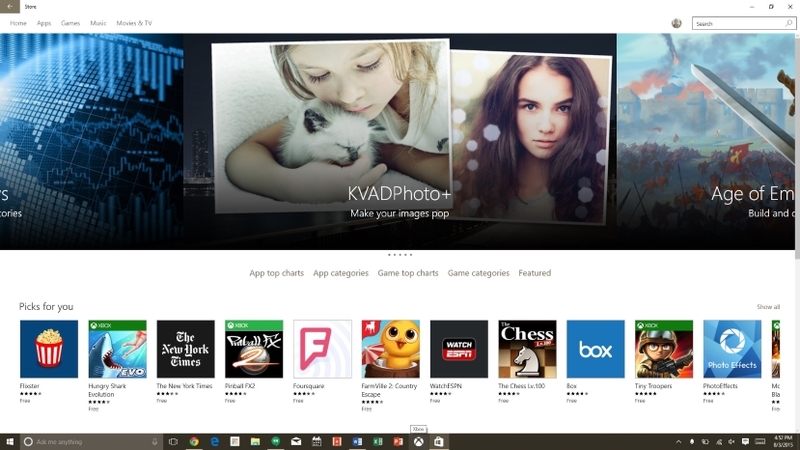 The Windows 10 Store is refreshed and a lot more intuitive to use. Microsoft hopes that with Windows 10 it will create a unified experience as well. Whether it’s an app on a PC, phone, tablet, or Xbox, Microsoft hopes to create the same experience. Given the large install base that Windows 10 will have with offering it free to a wide range of users, let’s hope it’s enough to entice developers to create apps for Windows 10. Though, that being said, it’s too early to tell. Like every other media store on the other competing OS’s, having music, movies, TV shows, and apps in once place makes sense and Windows 10 embraces this. Unlike Windows 8 that relied solely on the touch experience, Windows 10 has a balance of both touch input and mouse and keyboard input. When you’re using Windows 10 on a 2-in-1 or a tablet, the touch experience comes front and center. The taskbar becomes simplified and the start screen is more reminiscent of Windows 8/8.1. Tablet mode brings the full screen start menu and is quite easy to navigate. Even so, I found it a lot easier to multitask and navigate in the simplified tablet mode on my ThinkPad Yoga than any time I’ve tried on an Android tablet or iPad. Window snapping here is a wonderful tool, however clunky it is from time to time. Though I didn’t spend much time in tablet mode as I much prefer the desktop, users of a Surface Pro or other Windows tablet will be in for a great experience. Even though Windows 10 is a great step forward for Microsoft, there are a number of issues plaguing the OS. First of all, it feels a bit less polished than it should. Sometimes there is lag between the time you click something and the time it loads. 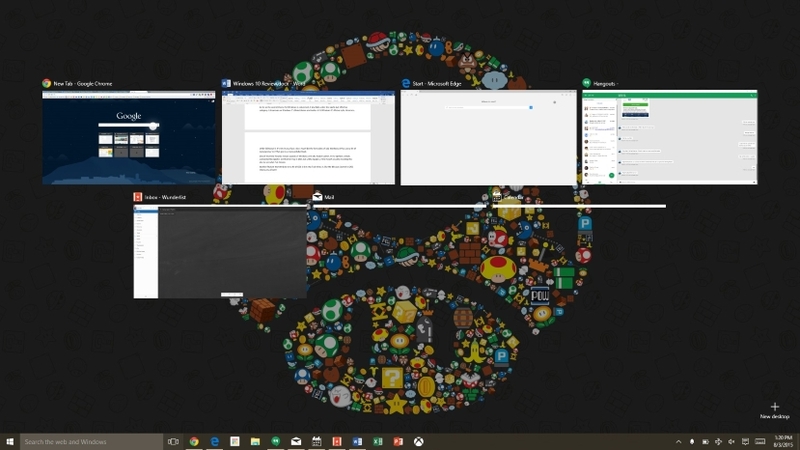 For instance, when I click “All Apps” in the start menu, sometimes the apps take anywhere from two to 10 seconds to show up and that seems to be a lot of it. From the time you click to the time you see something seems to be seconds. Not a deal breaker but Microsoft has worked hard on making Windows 10 polished and the lag seems to hurt that a bit. Add the fact that sometimes there’s ghost app targets that show up in my app drawer and it just seems to go nowhere. It just shows the bugs that Windows 10 needs to fix. 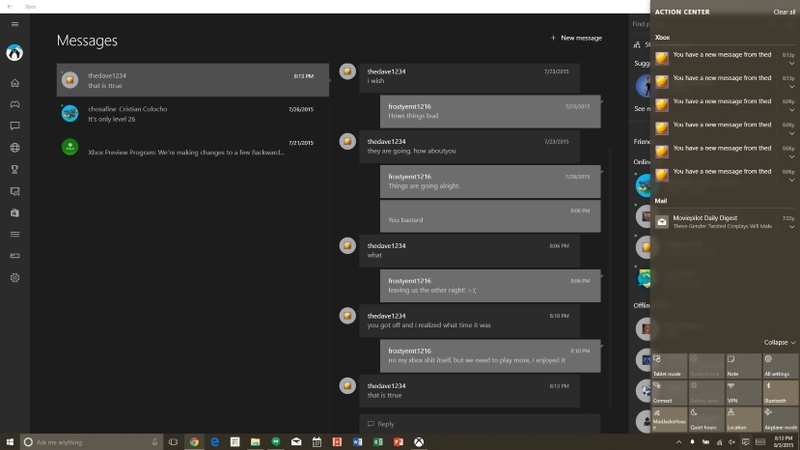 Random app ghosting is an issue with Windows 10. I would also be remiss if I didn’t mention the privacy issues people seem to have with Windows 10. Those who use Android or Google’s services shouldn’t think twice about them being on, but Microsoft did give users a way to opt out, however tedious it is to get through (look for a guide here in the coming days). The long and the short of it, Cortana spies on you (contextual awareness to provide you with relevant information), Microsoft can disclose the data it collects should it need to, data syncing is on by default (handy for syncing themes, wallpapers — thanks Cristian Colocho for the Nintendo wallpaper — data, and so on), your encryption key is stored in OneDrive by default, etc. For me it’s a non-issue. Google’s provided contextually aware information via Google Now based on the data it’s collected from what you search, etc. Not only that but Google provides relevant advertising by scanning email as well. Basically, with a way to opt-out, this should be a non-issue for most. I’ve also run into a few bluescreens as of late, resulting from driver issues. It turned out to be an issue with Intel graphics and once I removed the drivers and uninstalled it, the bluescreens went away. This is an issue because it seems that drivers can be hit or miss and there have been users complaining that installing the OS onto their devices has made their respective devices non-useable but I haven’t run into anything like that myself. Windows 10 has quickly grown to become my favorite OS to use. The return of the start menu is by far the most welcome “addition” to the OS. From the polished Windows 10 apps, to most everything working out of the box I’ve come to fall in love with my Windows 10 carrying laptop all over again. My Chromebook and Mac Mini haven’t been used since the RTM hit my machine in July and I have no regrets. That’s not to say Windows 10 isn’t without its shortcomings. Some aspects of the OS feel half-baked and there are random bugs to deal with, but overall, that hasn’t downgraded my experience that much. So now comes the $10 million question; should you upgrade to Windows 10? I’d say if you’re impatient, go for it, but be mindful that there may be a driver issue or two waiting for you. Windows 10, for me at least, has been quite enjoyable. If you don’t need it right now, I’d say hold off for when most of the bugs are squashed and your overall experience will be better for it. Even so, Microsoft has been pushing constant and sometimes daily updates to fix issues at hand, and I’d say within a month or two’s time, well, at least by the holiday season, Windows 10 will be a wonderful experience. Given that this is the last Windows, Microsoft has a good foundation to build its core apps and services.